Habitat for Humanity is successful because of the many volunteers who give of their time and dedicate themselves to projects. Without our volunteers, we simply would not exist. 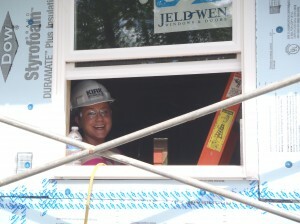 Volunteers perform a large number of tasks on building and rehab projects. These include assisting with interior demolition; framing; porch building; installing windows; insulating; tiling; sheet rocking; painting; siding; and landscaping, just to name a few. Volunteers are also needed to help “behind the scenes”. Helping with office tasks or serving on a committee, is just another way to give back to the community. Other ways to help include volunteer coordination, church and faith relations, fund-raising, partner family support, family selection, site selection and finance. Call or email our office to see how you can get involved!